Kristen was a PhD student shared by my lab and Florian Engert's lab at Harvard University and is interested in the control of locomotion. She has been focused on investigating a prominent midbrain nucleus, the nucleus of the medial longitudinal fasicle or nucMLF, seen in the image below. The nucMLF has been shown to play a role in the control of swimming, including the optomotor response. The slide show below will loop 1 micron at a time through a 2-photon stack of the nucMLF moving from dorsal to ventral. (Rostral is the top of the image and caudal is the bottom). You may see several large, prominent cells on each side of the midline (which are individually identifiable) in addition to many smaller cells. The medial longitudinal fascicle consists of the axons of the nucMLF which runs caudally to the spinal cord. These neurons were backfilled using texas red dextran. (Stack acquired with Eva A. Naumann, Engert Lab). Check back for further updates! Contact info is listed below. Kristen is currently in Paris living the life of Riley! 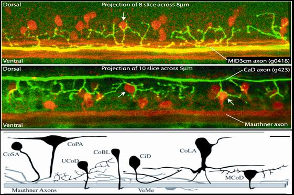 Also:Optogenetics in a transparent animal: circuit function in the larval zebrafish. CONB, 2013.